The S4OPTIK 2000-CH Examination Chair is the perfect choice for today’s modern practice. 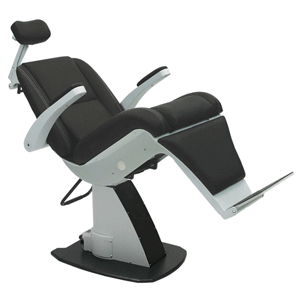 It features a precision engineered Cradle Track System, convenient Tilt Release Controls, strong, yet silent Power Lift System, intelligent Rotation Lock, robust Foot Rest, functional Armrests, sensible Height Control locations, and improved Headrest design. Precision engineered Cradle Track System provides effortless recline with perfect counterbalance. One-handed release/control mechanism for precise recline control, accessible on both sides of the chair, for easy, convenient patient positioning. Powered by Swiss designed linear actuator for smooth and virtually silent lifting with a 500lb (227 kg) capacity. The chair seat raises to 31” (78.7cm) and lowers to 23” (58.4cm). Foot actuated Rotation Lock provides a firm positive lock. Accessible from both sides of the chair, our unique design eliminates operator bending or reaching. Sensible HEIGHT CONTROL LOCATIONS Height adjustment controls accessible from the slit lamp arm, stand console (when paired with a S4OPTIK Instrument Stand), or movable foot switch. Upholstered for comfort, plus individually retractable for patient flexibility. Solid construction provides support for ingress/egress. Robust foot switch provides raise/lower control for chair height adjustment. advanced HEADREST Single handed control for easy positioning of the Headrest, insuring head and neck support. Engineered for a positive, non-slip lock in any location. A large, broad and stable foot rest provides safe and easy ingress/egress.